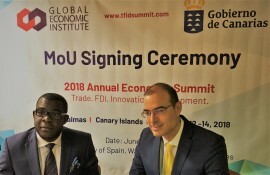 Washington DC, United States: On June 27, 2018 at the Embassy of Spain in Washington D.C., United States, senior officials of the Global Economic Institute and the Government of the Canary Islands signed a Memorandum of Understanding (MoU) establishing a strategic framework for the Annual Economic Summit to be held from November 12-15, in Las Palmas, Canary Islands. 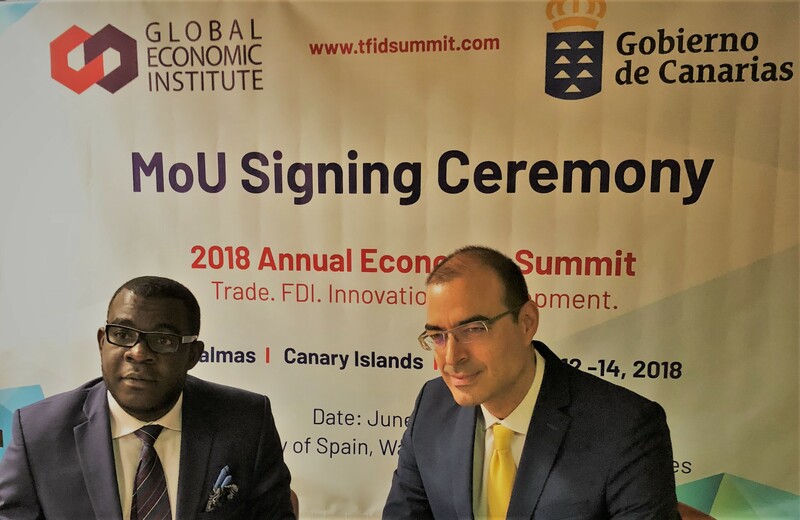 The President of the Global Economic Institute, Dr. Fred Olayele, signed the MoU on behalf of the Institute, while the Chief Executive Officer of Proexca and Director General of African Affairs, Pablo Martín Carbajal, signed on behalf of the Government of the Canary Islands. Held every year, outside Canada, and focused on Trade, Foreign Direct Investment, Innovation and Development, the Annual Summit brings together stakeholders from around the world to explore various issues, with emphasis on solutions. In addition to providing a platform to examine issues related to the triple helix of industry–academia-government interactions, the Summit offers great networking opportunities, strategic business meetings, site visits, and other sightseeing opportunities. Details are available here: www.tfidsummit.com. The 2017 Summit was held in Lagos, Nigeria. The 2019 host will be announced on the last day of the 2018 event this November in Las Palmas. Proexca is a government-owned corporation with the main objective of advancing the internationalization agenda of Canarian companies, and the attraction of strategic investments into the islands.